After reading The Road from Coorain, by Jill Ker Conway, I was interested to know what happened to her after she moved to the United States from Australia. Her story was intriguing and somewhat tragic, but she was such a courageous person to leave her home and make a new start on another continent. 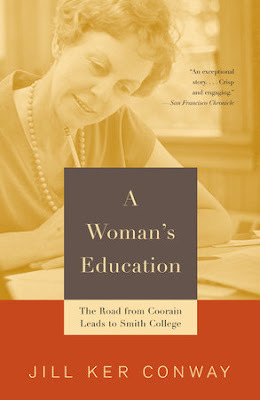 Unlike The Road from Coorain, this short story reads very quickly, and covers Jill's ten years as Smith College's first woman president, beginning in 1975. Smith College is a private women's liberal arts college in Massachusetts. Jill was attracted to the unique history of Smith College, founded by Sophia Smith ("spinster inheritor of a railroad fortune") who decided to spend her wealth on a "college for women that would be national in scope and would rival elite male colleges." The school balanced its two ideals: one in voluntarism, preserving the natural environment and caring for the needs of children and the elderly; and the other in women working in the professional fields, such as law and medicine. a first step along the way to creating an institution that concerned itself with educating all women, not just eighteen-to-twenty-two-year-olds. 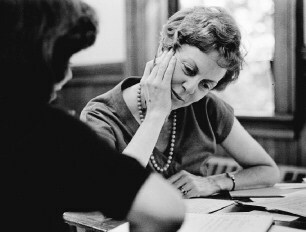 But one issue she had to debate was the concern of coeducation, which was becoming the norm for many male-only colleges. Should Smith admit men? In addition, her goal was to "help build an educational system that made intellectual maturity possible for all women." Jill thought it important to preserve the classical Western tradition, and not completely throw out philosophers because they were men; but she wanted to include women. I revered the tradition of Western scholarship...but I also believed passionately that that tradition needed modifying by equally rigorous scholarship about women. Not scholarship of the ladylike"petit point" kind, but rigorous, unsentimental, root-and-branch scrutiny and questioning of the categories and assumptions that shaped our understanding of the past. I did not know this was a thing in the seventies, but the idea of "enforced, conformity to heterosexuality" had its roots even back then. Yikes! A lifetime of studying gender systems...had convinced me that one of societies' major oppressions lay in the effort to coerce sexual behavior. We need a framework of law to manage the institutions that care for the rising generation, but that framework isn't dependent on enforced conformity to heterosexuality. Apparently, Jill believed this, but also recognized that "a women's institution resting on voluntary support couldn't move too far ahead of the informed opinion in the larger society." She also thought that "America's idiosyncratic attitudes on homosexuality" came from "Puritan fear of sexuality." Huh? Speaking of the issue of raising money, which was a major responsibility as president: Jill would not completely admit that she agreed with the ideals of capitalism, but she did appreciate it when it came time to "raise capital, invest it well, and generate a surplus to be invested in continuously improving a Smith education." Yay, capitalism! She also permitted student's "poorly planned or sloppily executed" projects to fail instead of acting like Big Daddy Government who rescued them financially. As you can guess, Jill was a feminist, and she was "intent on making a Smith education one that gave women the tools to think critically about their own experience (which makes sense to me), and to deconstruct patriarchal intellectual authority wherever necessary." A lifelong feminist, I'd been in the business of deconstructing male power since girlhood. Basically, she said she needed to "fight the entrenched male power within a women's college..." asking for "funding to support research and teaching about women's experience across the humanities and social sciences." So I understood the goal and purpose and dilemma, but I do not agree with taking down the male side of history. Why not insert and assert the female portion? Can we not do that instead of declaring war on men? Can we just rise above it? I thought it was rather silly when Jill wrote "her or his" as opposed to the common order "his or her" because it is just unnecessarily petty and we should be able to move beyond such little nuances. Today she would be accused of being gender insensitive by writing either one! How's that for foolishness? But I digress. Jill, who was married but unable to have any children, recognized that women wanted to find ways to achieve serious work and creativity in their own lives, and still combine marriage and family. She also sought to find ways to encourage women into higher wage-earning careers to close the pay-gap, and personally "called CEOs of Fortune 500 companies to ask them to consider recruiting women from Smith's campus." By the early eighties, new disciplines needed to be introduced to Smith College in order to keep up with the "culture wars." Jill regretted missing those cues, which signaled an end to Western Civilization curricula. She said it would have been a benefit to include non-Western ideas and customs. But by now she was already considering stepping down in order to spend more time caring for her aging and ailing husband. She also felt satisfied in what she had accomplished, and now it was someone else's time to do a better job. She considered what she had learned in her ten years, like how women were accused of being aggressive if they tried to do what men did; how women who could not break into men's fields or were overlooked for higher positions often founded their own organizations and businesses to do as they pleased. Now Jill wanted to know how to change those situations, specifically in the business world; hence, she "decided to give time to corporate governance." Being environmentally minded, she also wanted to educate herself on ecofeminism and its critics (whatever that was). She was also convinced that Western Civ. vs. non-Western ideals was a battle worth taking up. This was the political battle of ideas that inspired the new right and gave birth to the leftish postmodern view of cultural politics. Its resonance at Smith was complicated by the gender composition of the faculty, because deconstructing the narrative of European superiority also undermined the concept of the [evil] Western male hero. I inserted the [evil] for her. Jill said that in 1975, a Smith student might have read works by great male authors, but by 1985, she would choose between "dead white males" or a female author. It was a costly curriculum change, but she thought it necessary that students be exposed to the "[white European] male bias in the canon." Finally, she presented her plan for the remainder of her life: to spend part of her time becoming a writer, creating a record of feminist ideas she thought incorrect. She wanted to write about what women were not supposed to desire: ambition, adventure, intellectual power, physical courage and endurance, risk taking, poor mother-daughter relationships (obviously). Then she'd spend another part of her life educating herself on environmental issues, especially damage caused by [destructive] male aggressiveness. Thirdly, she would spend time helping to govern institutions of business, higher education, and social causes she cared about. And finally, she looked forward to reading aloud in the evenings with her husband (which I think is a pretty cool idea for husbands and wives to do together -- even if I do not have one of these myself). Regardless of her opposing liberal ideas, I like Jill. She seemed to be fair and just. On some issues she was a bridge between the old and the new. She could compromise intelligently and reasonably. She was probably, to the generation she served, a breath of fresh air, a leader, and a confidant. She appeared to be extremely likable and sounded approachable, even if she disagreed with one's ideas. often wondered what Virginia Woolf would have made of it. This was not just a room of one's own but an entire institution that its graduates owned, beholden to no one but their female predecessors. It gave women, however briefly, a sense of owning their place in life, a place never thereafter easily surrendered. Yes, if you are open-minded about early liberal, feminist ideals, or you like biographies, in general. Again, it is a quick read about an intelligent female leader who took her work very seriously. This is a really good review. I had read about the author and was turned off by what little I learned. She seems to have gone the way of popular culture. Every thing you said she stood for is a popular cause. So much for independent thinking. You broke down her beliefs and why they are not really pro woman, very well. Let's stop looking at people's accomplishments according to gender. What I hate is that the feminist mind set first decides to define "oppressive" as having family values. Then proceed to treat women as though they were poor, mentally handicapped "damsels in distress" who need advocating for. And, as you say, the same feminists are now considering gender "fluid". So how does that fit in with male tyranny? Will we now have two different kinds of women? Those that are privileged and those that are not, or when a man "identifies" as a woman will he join the ranks of the oppressed? And what about the women who identify as men? Will they in turn become "evil tyrants"? I hope this fad of "victim hood" finally passes. It degrades all humans. Honestly, Sharon, I'm afraid it is here to stay forever. In a Republic, victimhood is all the rage b/c it garners a lot of saviors who take up their causes. There is no shortage of things to be helpless about. I sense that Jill was being gentle on her true feminist opinions, as I found her to be very judicial in her approach to radical issues that she knew the majority may not be ready for. From her first book I read, I recognized right away that she was a woman before her time -- who grew up isolated from the whole world on a ranch, in Australia. So this was definitely self-learned. 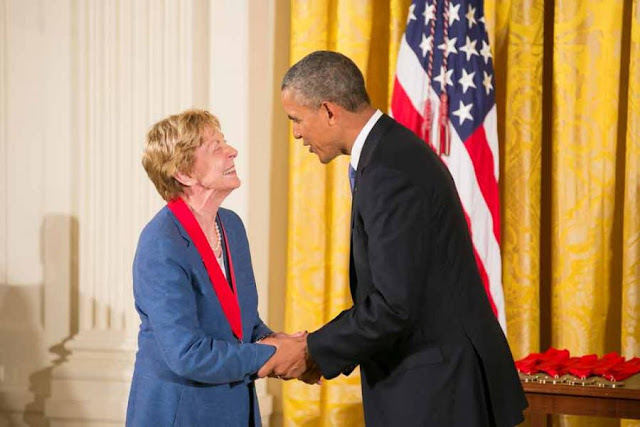 During her later education and experiences, it really grew from there, and again, she was way ahead of her time on issues of feminism and gender equality and environmental issues. While I easily agree with her on many of her educational ideals, the gender stuff is head-spinning; and yet, here we are fifty years later...using those words like: "entrenched patriarchy," and "enforced heterosexuality"? That's crazy to me, but here they were using it back in the 70s! I'm afraid we have opened a can of worms with all the mix up of gender identity, as it is now very mainstream, acceptable, and even celebrated. What a mess we have created. I forgot to mention that my husband and I read together every night. What do you mean "I do not have one of these myself." Do you mean a husband? I thought you were married? LOL, yes. I've got a husband -- just not one who would enjoy reading together. : ( He'd rather watch Netflix or scroll through FB videos for hours and hours. I've got several of Coorain's books on my to-read list because you always make them sound so interesting. This one is no exception! Well, do begin with her first one. It was a good read. Sad, but worth it.